Hampshire Collegiate School near Romsey is an independent school for boys and girls 2–18. Based on a 130 acre site – once home to Florence Nightingale which includes a beautiful Grade II listed woodland gardens, sports pitches and educational facilities. They combine an ‘academic ambition’ programme with development of a wide range of skills and interests for every pupil. 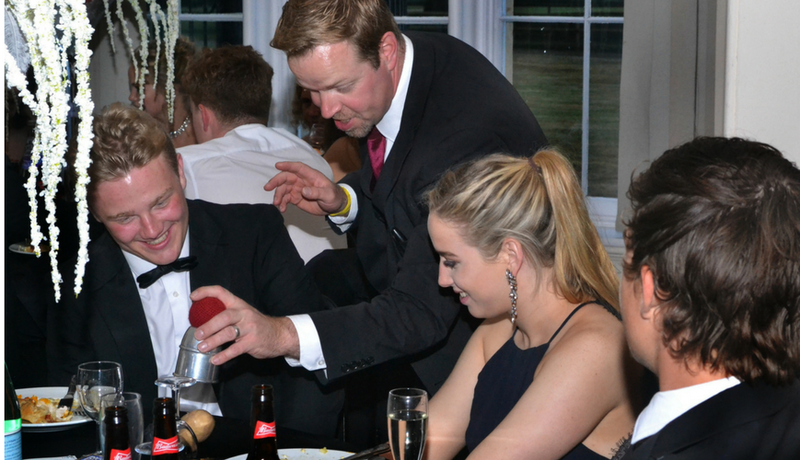 As one of the premier schools in Hampshire it was an honour to be asked to perform my close up magic at the 2017 year 11 prom. The evening started with parents and pupils enjoying a drinks reception in the main hall. I was asked to entertain the parents first with some mix and mingle magic. Performing to small groups of parents and staff I was able to meet most of the parents who were proudly watching their children enjoy a great celebration of a long journey through Hampshire Collegiate School. It was soon time for the parents to leave and the party to really start. 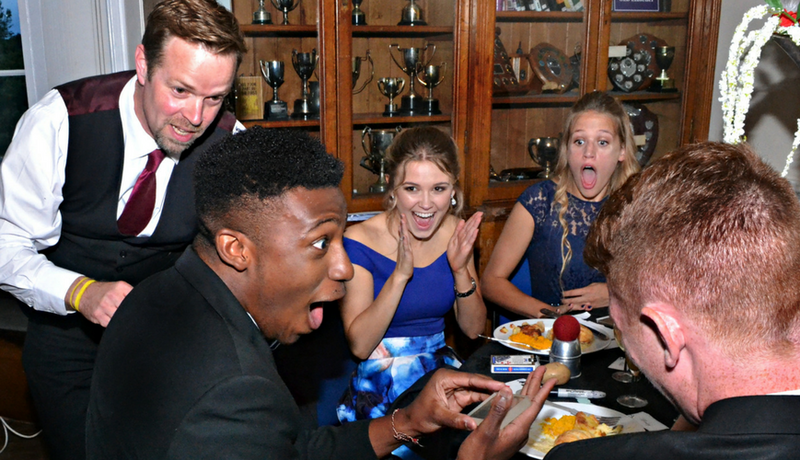 The students enjoyed a delicious 3 course meal with table magic by yours truly, as you can see by the photos there were some great reactions! I continued with some magic and then left the students to enjoy the rest of the evening, a photo booth and large sweet trolley were available with many unique photos being taken. I wish all the students of year 11 2017 an amazing future and look forward to performing there again. Best Reaction of the Night Award goes to…. 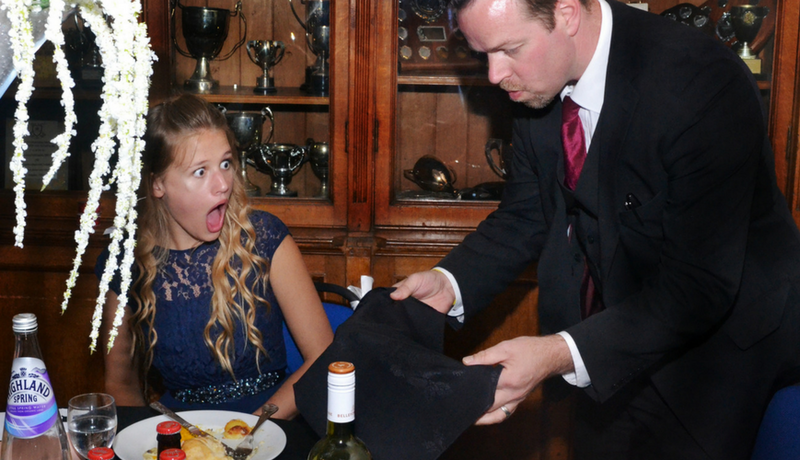 This had to be the best reaction of the night with my performance of the floating wine glass. Just as the glass started to lift of the table, well you can see by the reaction on this girls face, she did not know what to do with herself. And it took her quite a few minutes to get over the experience. Seeing a wine glass floating off the table right in front of your eyes is not something you see every day! 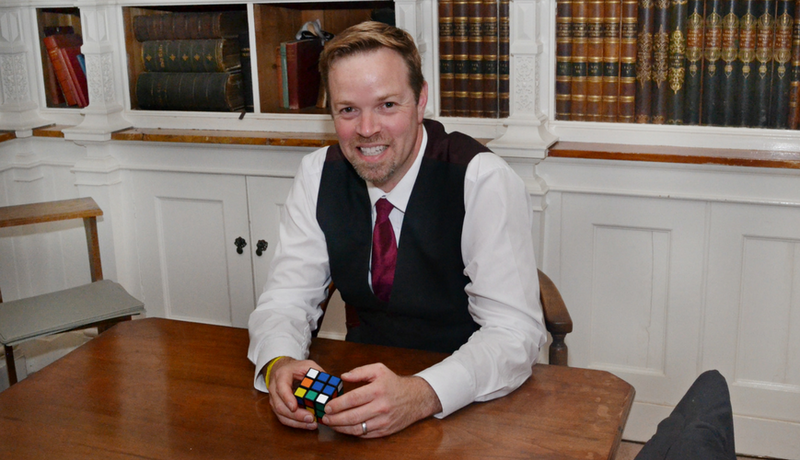 Roger Lapin is a Close up Magician based in Hampshire and available to hire for Weddings, Parties & Corporate Events across the UK and internationally. With a unique repertoire and sharp sense of humour Roger is the perfect entertainment for any event large or small. If your event has over 100 guests then we recommend hiring more than one magician to ensure all the guests get to see some magic. Roger knows many Magicians in Hampshire and can book them on your behalf. Each magician has performed with Roger many times and are all members of the world famous Magic Circle.